The John Hettinger stakes features nine fillies and mares running 1 1/8 miles on Belmont's inner turf. Because these races start in a turn, inner turf can give inside horses a major advantage, especially for early-speed types. The 5/2 morning line favorite, LADY JOAN, is on the rail and her past performances are littered with 1s and 2s for position calls. The only other horse that consistently gets to front out of the gate is CONQUEST HARDCANDY (PP: 10 ML 20-1). She is either too far outside to get to the lead in a turn or will have to hustle so hard that HARDCANDY won't have much left for the late run. Effectively, her post-position makes it extremely difficult for the 10 to run her race and win. Eliminating horses, for whatever reason, is just as important and identifying possible winning candidates when handicapping. We believe LADY JOAN is going the be a major factor but believes another entrant could get the best of her. Form our bonus commentary, "FIFTY FIVE is making her third-start following a short break. She is one-length and two-necks away from winning five in a row. LADY JOAN is on the rail with inside speed, which should give her an advantage in a race that starts in a turn. WAR CANOE's speed ratings suggest she'll be competitive. Her closing style has helped her finish no worse than fourth in nine of her last 10. MUNCHKIN MONEY is making her third-start off the bench and jockey, John Velazquez has won six of his last 12 races." The lady's hold the course in the 8th with seven three-year-olds and upwards running 6.5 furlongs on the dirt. In the current meet's first 14 races at 6.5-furlongs, six were won in wire-to-wire fashion. That's essentially a 6/5 angle. In other words, if you can identify the fastest horse out of the gates with the stamina to make it to the wire first, it's a good bet if you get odds of 6/5 or higher. The GALLANT BLOOM HANDICAP 9/5 morning line favorite, LEWIS BAY (PP: 3) is traditionally a front-runner and could be bet down to 6/5 by post-time. While we like LEWIS as a top candidate to hit the wire first, our analysis may have identified a horse with a penchant for running her best at Belmont. "YOUR LOVE is a length away from being undefeated at Belmont Park. A horse for the course. LEWIS BAY's speed ratings are tops in the field. The only concern is sometimes he takes a step back in second starts. HIGHWAY STAR's trainer, Rodrigo Ubillo, has won four of his last 10 graded stakes races, he places them well. 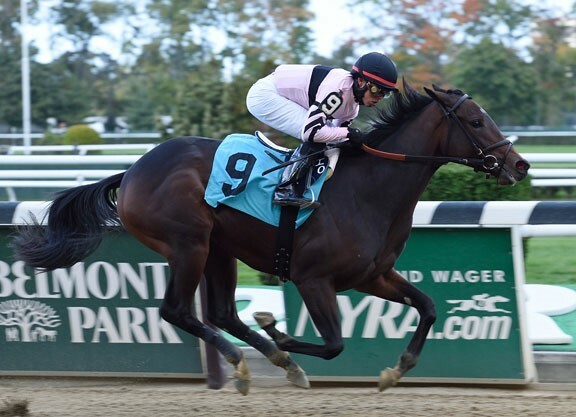 STILL THERE just ran second in a Grade 1 stakes, a small step down might be the difference." The boys come back to the track as the ninth race returns to the inner turf for 1 1/8 miles. The ASHLEY T. COLE STAKES is a good betting race with 11 horses and a tepid 3-1 morning-line favorite, OFFERING PLAN (PP: 4). As we mentioned earlier, inner-turf races should favor inside speed horses, but this race doesn't offer much in the way of dependable out-of-the-gate-and-go types. There are a few longshots that might try to steal this one, but they are starting outside. Of the two, our pro-subscriber's bonus commentary includes one, "OFFERING PLAN has finished first or second in seven of his last 10 races. He's also making his third start off a break, should be his best. GUCCI FACTOR has won his last three on the grass, two of them at Belmont. CALL PROVISION has owned the inner turf at Belmont, three wins, three seconds in last seven. WINSTON's CHANCE is one of two front-runners in this field. He could get the lead early and set a reasonable pace. Why not at 30-1 as one that could steal the race." GET OUR FULL CARD BELMONT PARK PICKS PLUS ALL OTHER TRACKS RUNNING!